Is your dog lonely when you leave for work? Does your house look like it was ransacked when you get home? Are you exhausted and too tired to play with your dog when you get home from work? Is your dog disappointed when he doesn’t get to play with you when you get home at the end of the day? Does your dog think you are his new chew toy? How much did that sofa and carpet cost? 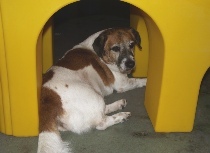 Is your dog bouncing off the walls when you get home? Are your neighbors complaining about the noise? Do you want your dog to be social with other dogs and people? Wish your dog had simple manners? Do you wish you could take impromptu day trips without leaving your four legged family member home alone? Would you like to spend a few hours after work at the gym? Shopping? School? ...and not have to worry about running home to let your dog out? Or.. Do you just hate leaving your best friend home alone all the time? Many common behavior issues are due to limited human interaction. If you answered yes to any of these questions K9 Kampus is for you! What makes K9 Kampus different? Dogs are social creatures by nature and require exercise and socialization and mental stimulation on a regular basis. 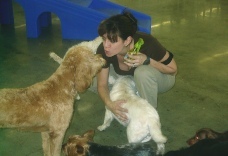 Daycare satisfies these needs resulting in a happy, relaxed and well- adjusted dog. 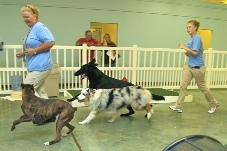 Let your dog enjoy a romp with friends while you work, run errands, have meetings, or shop nearby. Daycare is a fabulous alternative to leaving your dog home alone for long stretches of time, especially if you often wonder what type of mess you’ll find when you return. 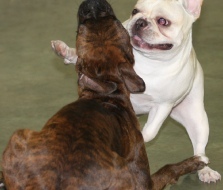 View our articles page for additional information on the benefits of social play for your dog.